Earlier in the week I took a walk through the woods. Normally on the first warm day of the year (70F or higher) the Winter Ant, Prenolepis imparis, is holding their nuptial flights. But it's been unseasonably warm here and fairly dry for the month. Normally melting snows and rains keep the ground moist so these ants can fly and have no fear of digging into hard soil. So it's looking like they're not going to fly until some rains move in. 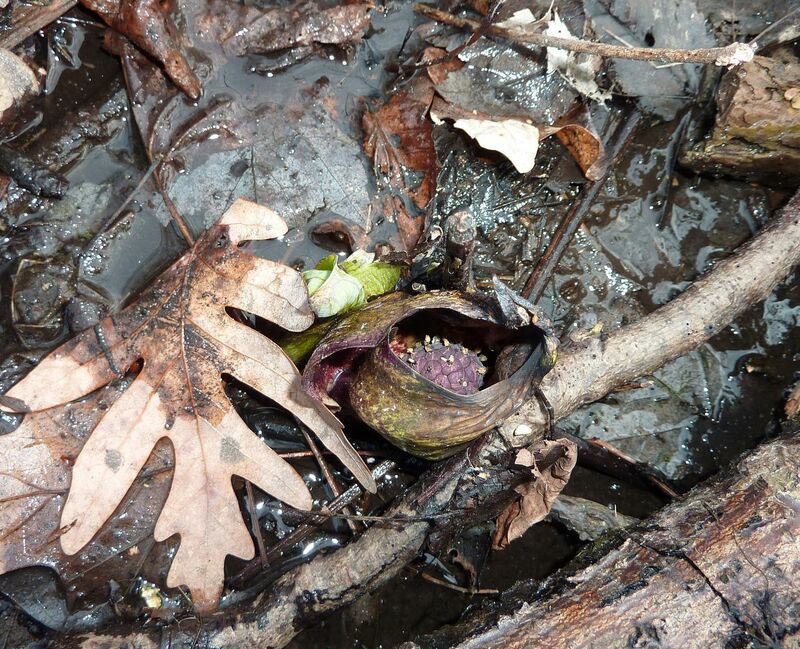 While I didn't find any ants, I was able to find some Eastern Skunk Cabbage, Symplocarpus foetidus, out blooming. 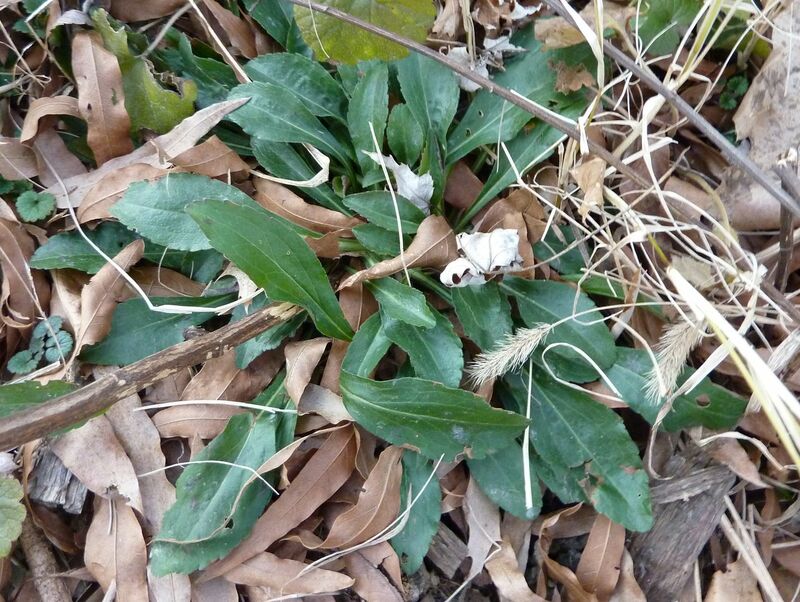 This plant is more easily recognized by its smelly cabbage-like leaves in late spring and summer (I'm not sure if it dies back or not). 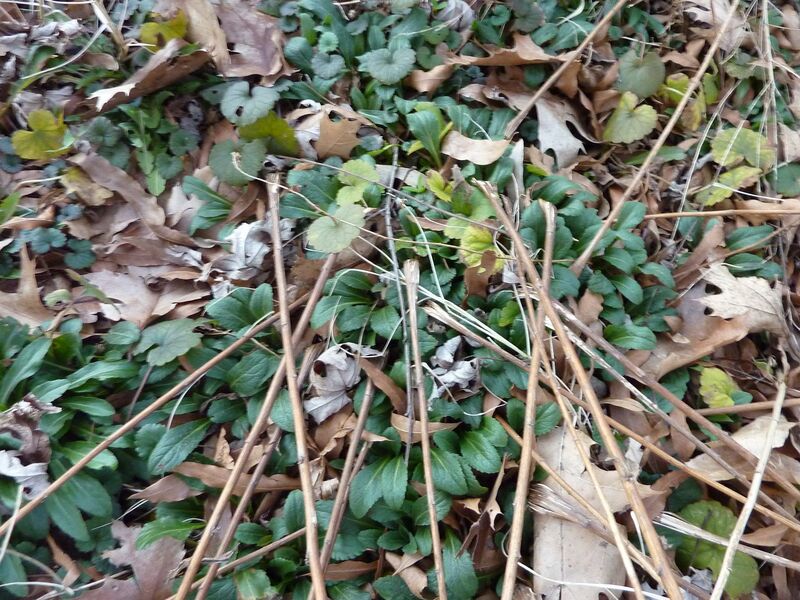 The flowers are among the earliest to bloom and produce their own heat to melt on through the snow. The hood around it provides shelter for early pollinators, mainly Bumblebee Queens, Honey Bees, Carrion Flies, and Beetles. The flowers range from the size of a tennis ball to about that of a soft ball. 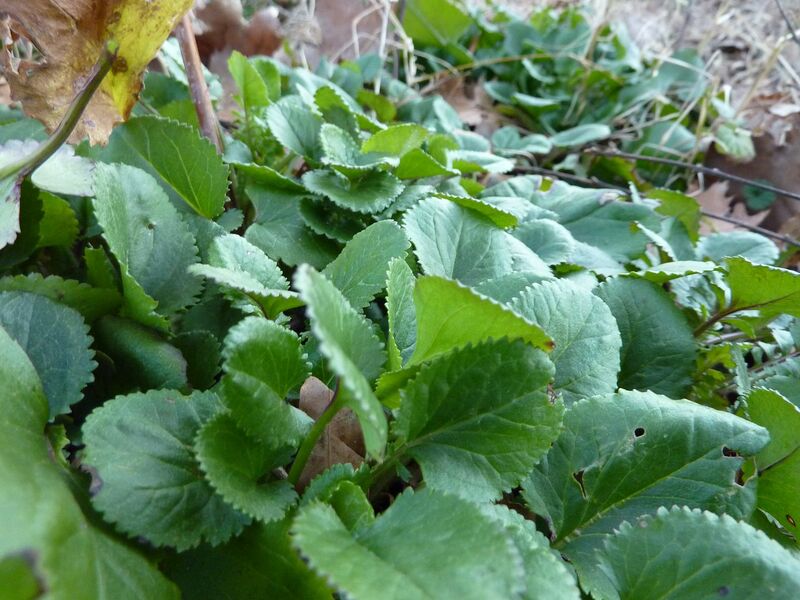 They're also tricky to spot and if you're not careful you'll be walking through a patch of them without realizing it. 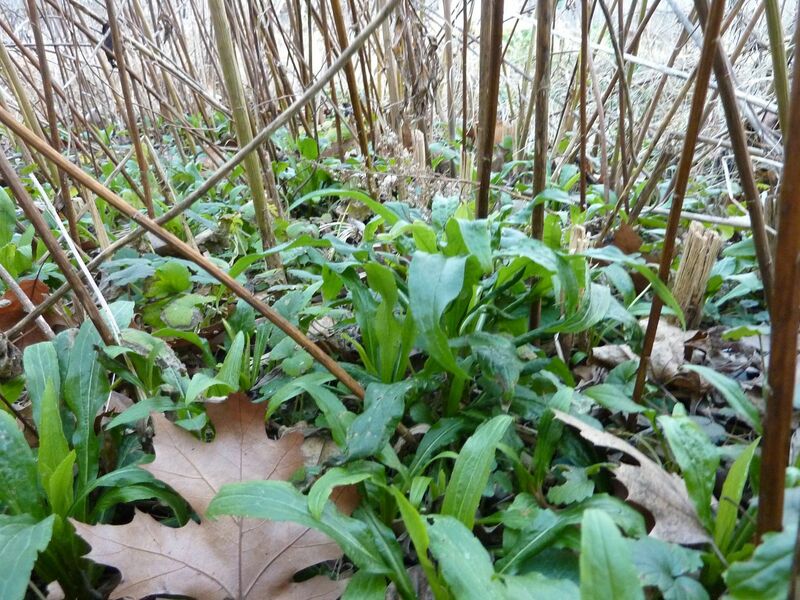 They grow best next to creeks and wetlands, but not typically in the sandy banks; they're more a layer or two inward. Locating patches of black decaying muck (as seen above) is a good place to start. This type of area can be tricky to walk on so step with caution. They'll also be growing in areas around these muck patches. In the absence of sandy banks, plants may even be right in the water partly submerged. The flowers open and close with the sun. In this way they can keep their pollinators nice and warm over night. Folklore enthusiasts enjoy pointing out that after pollination the hood does not open up again and thus "becomes a tomb for any pollinators locked inside!" While I'm sure this does happen, I have to say of the patch I looked at I was having trouble finding flowers that didn't have some sort of tearing or damage to them. I'd go as far to say mining and carpenter bees could easily chew their way to safety. One road block though might be the foul odor this plant is know for. 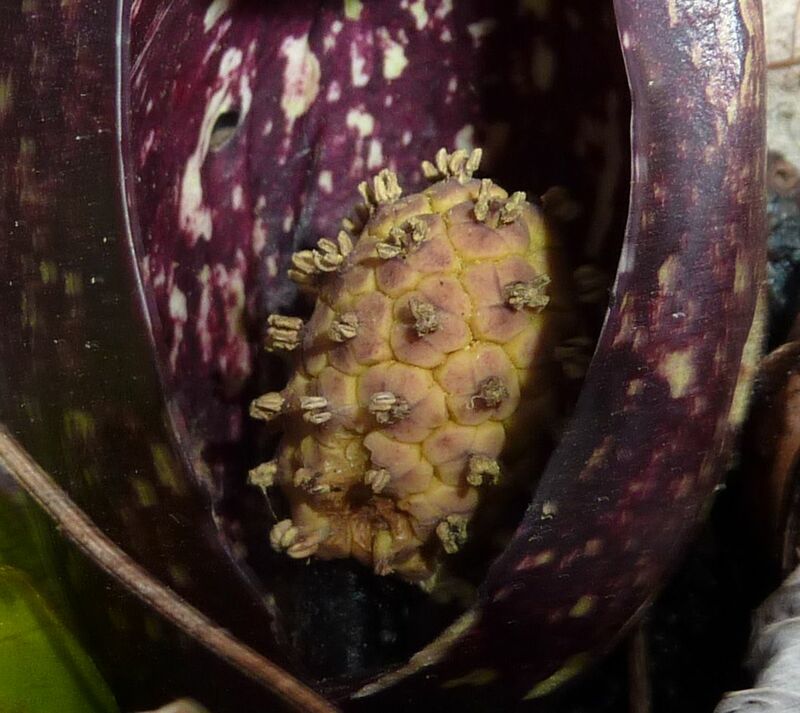 The flowers don't omit it much but the fleshy parts of the plant sure do when broken off. (Maybe this has an adverse effect on insects chewing on the plant?) 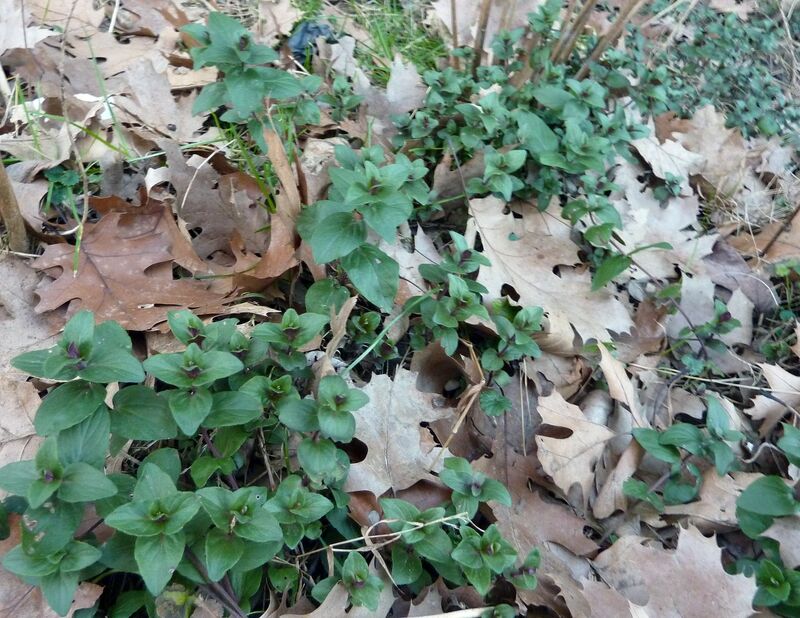 Once the green leaves grow in and the wind starts blowing, I recall it's hard to find plants that don't stink something awful. While it is native, I can't say I recommend it for the garden. 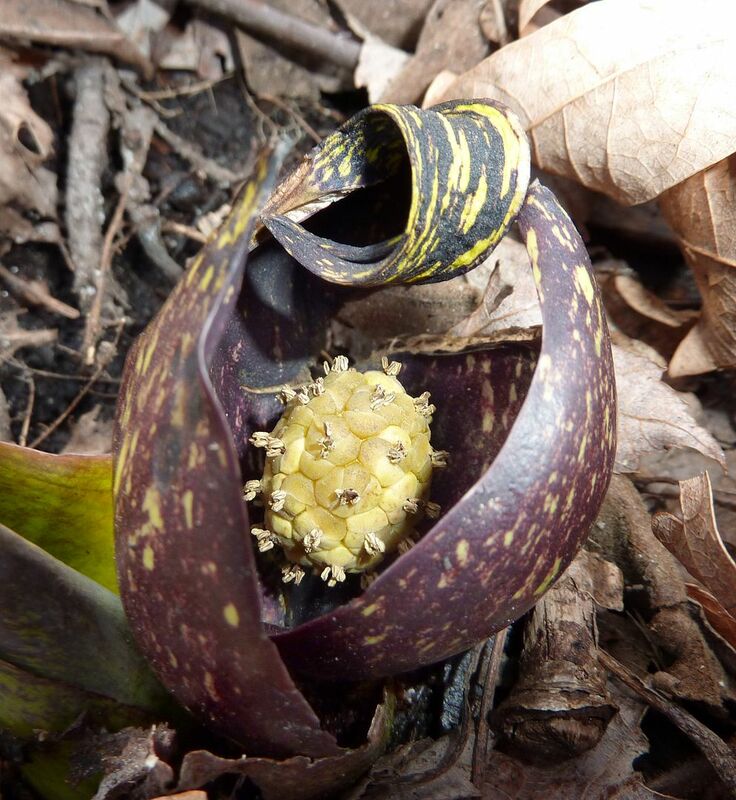 Though it does have a Jack in the Pulpit quality to it. 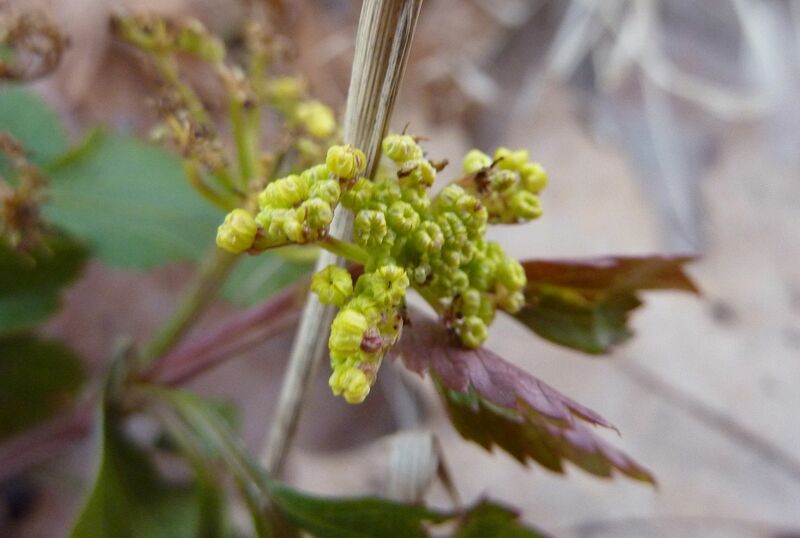 The flies and beetles are attracted to this plant for the foul odor. Typically they want to get on with their life cycle and the well preserved corpses of animals that starved or froze to death over the winter offer the first meal for such insects. By smelling awful the plant attracts plenty of flies and beetles to it's bloom for pollination. Bees are more drawn in by the abundance of free pollen the flowers are absolutely bursting with. Whether it's wind pollinated or attracting flies, bees can't resist pollen when the plant is offering it so freely. 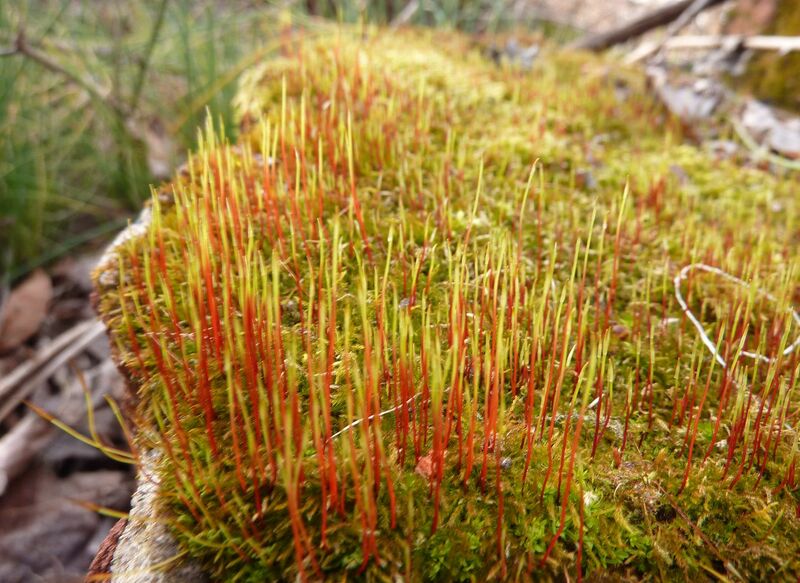 Mother Nature's own version of the red carpet seems to be rolling out as assorted mosses send up their flowering shoots. 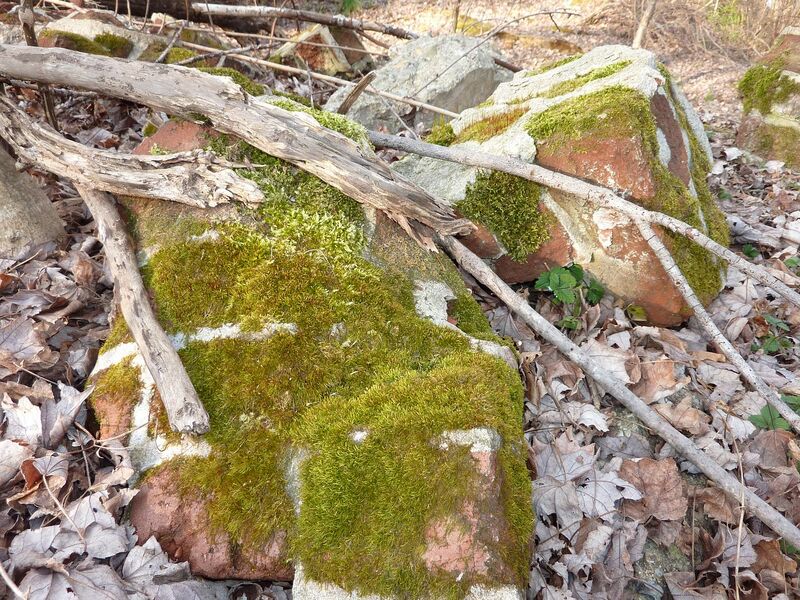 While exploring the woods earlier this week I came across large clumps of bricks still cemented together. I think someone had dumped an old fire pit back there. The moss was absolutely clinging to it! 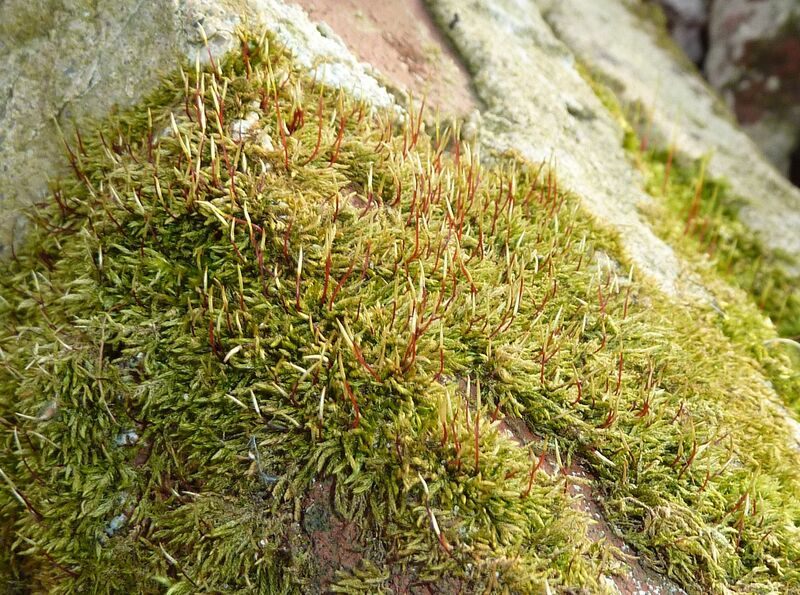 I don't know enough about mosses to identify but clearly there are multiple species growing here. This makes me wonder how easy they are to grow from seed. Though I hear an easier method is to ground up whole clumps with a can of old beer and a table spoon of milk (sugar? ), or some recipe to that extent. This is an excellent video on the reforestation project that's been going on for the past few years to help preserve the Monarch Butterflies' over wintering ground. Here is a link to the organization's website, Forests for Monarchs. The perfect idea on what to do with those old roses from yesterday's Valentines festivities. Actually I'm not sure what these ants are carrying but I know leafcutter ants will target roses when cutting for their fungus gardens. Don't understand French? Here let's award winning actress Isabella Rossellini translate some of the video with her graphic reenactment. Generally it's not uncommon for a queen honeybee to mate with 8 to 16 males during her nuptial flight. They pack her with enough ... we'll call it "energy" to lay roughly 1,500 to 2,000 fertile eggs per day for the next 5 years. So I just realized this year that Prairie Nursery has greatly expanded their selection of gardens this year. One of which is call the "Moon" Garden. And I can't help but wonder if this is a friendly poke at Prairie Moon Nursery which doesn't have such a selection. Not that this matters much. Moon Gardens consist of white or pale colored flowering plants which glow in the moon light at night. I think this is an over rated concept. Though it would be neat to see whether any of the plants bloom with the lunar cycle at all. Often white flowering plants are fragrant and pollinated by moths at night. From what I can gather online these gardens tend to focus more on having water features, nick knacks, stone work and such to go along with the plants. I'm tempted to propose a Sun Garden but typically prairies are already over saturated with yellow flowering plants, especially in late summer. 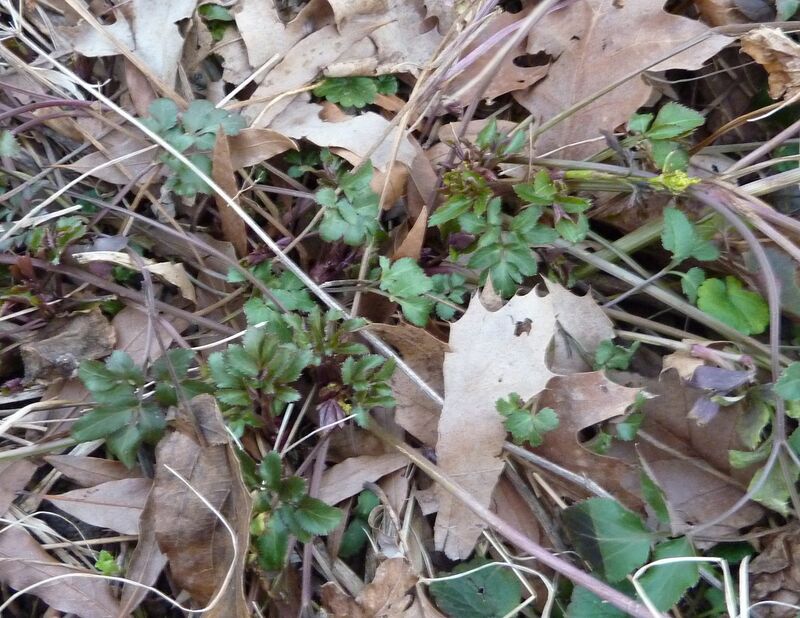 That's this year's flower buds next to last year's berries. Lonicera sempervirens is a native honeysuckle that blooms with the early migration of the hummingbirds, though this year I think it's going to flower even earlier then that. At this rate it might even beat the Daffodils. 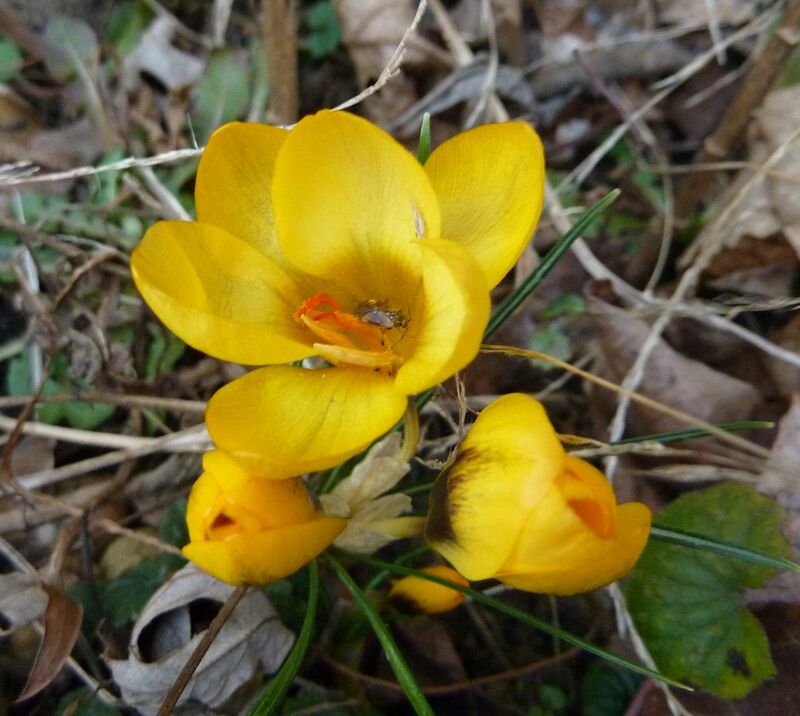 Something that is blooming is the yellow crocuses. 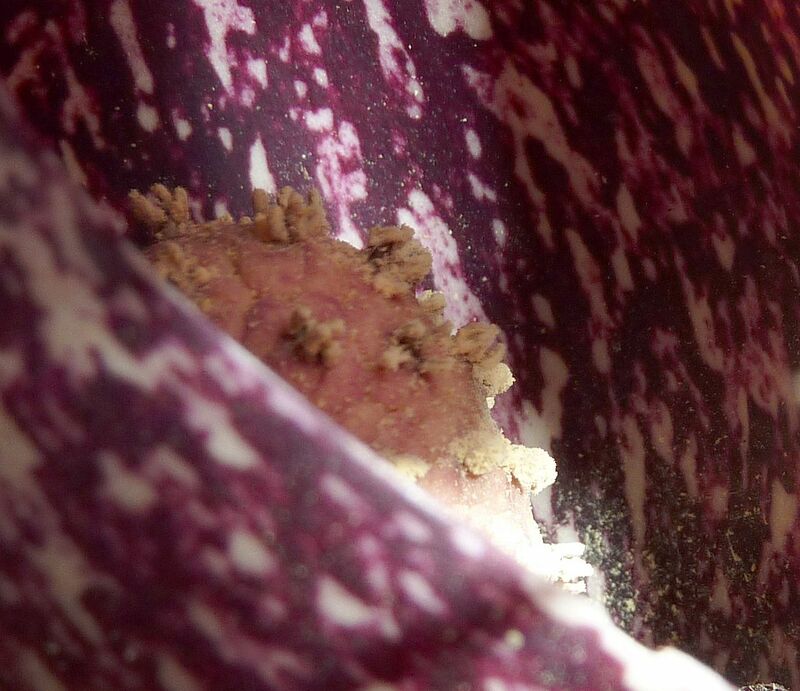 Note the stink bug (dead or dormant I think) trying to stay warm inside the flower. 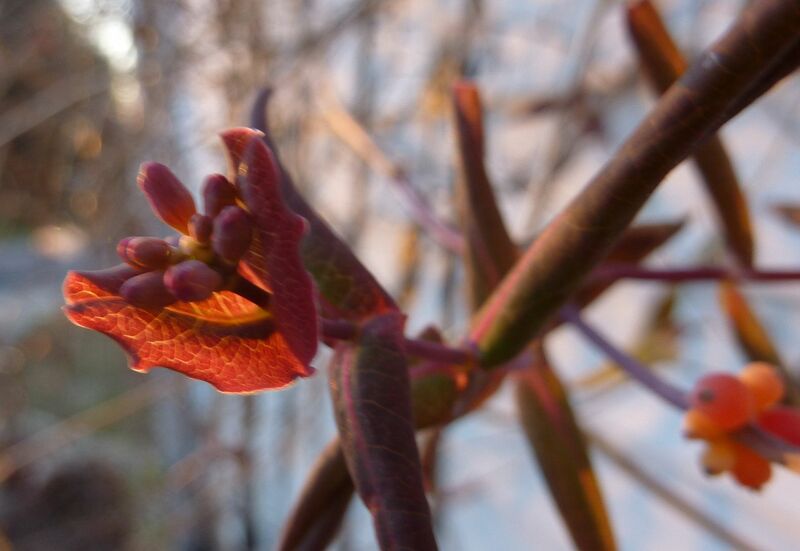 So all these early blooms got me wondering what else is pushing out new growth this early. This years crop of Tall Goldenrod, Solidago altissima, is getting a head start on the invasion this year. I think it's time I finally ripped a few dozen of these out of the garden. Solidago rugosa 'Fireworks' is also spreading nicely. The Mountain Mint, Pycnanthemum sp., is conquering the milkweed patch nicely. I'll be ripping this out liberally. The stuff smells great and minty too. 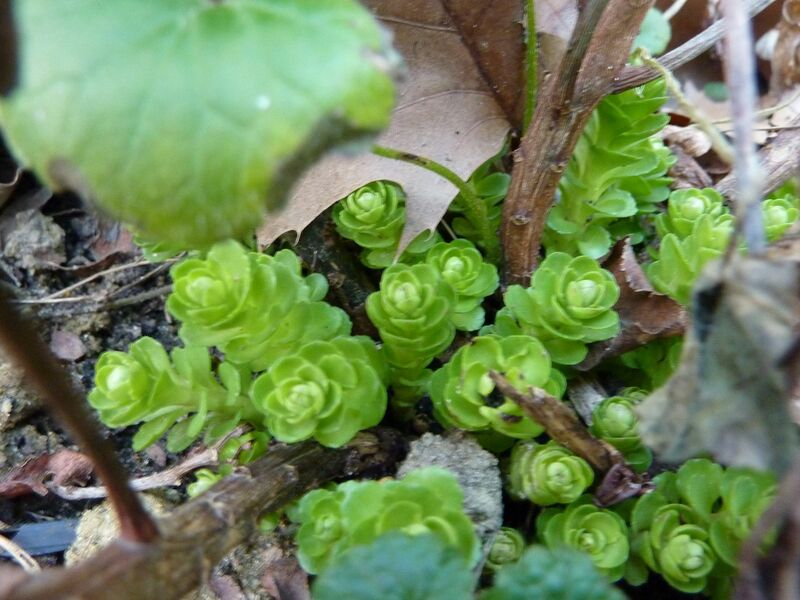 The Sedums are bursting back. 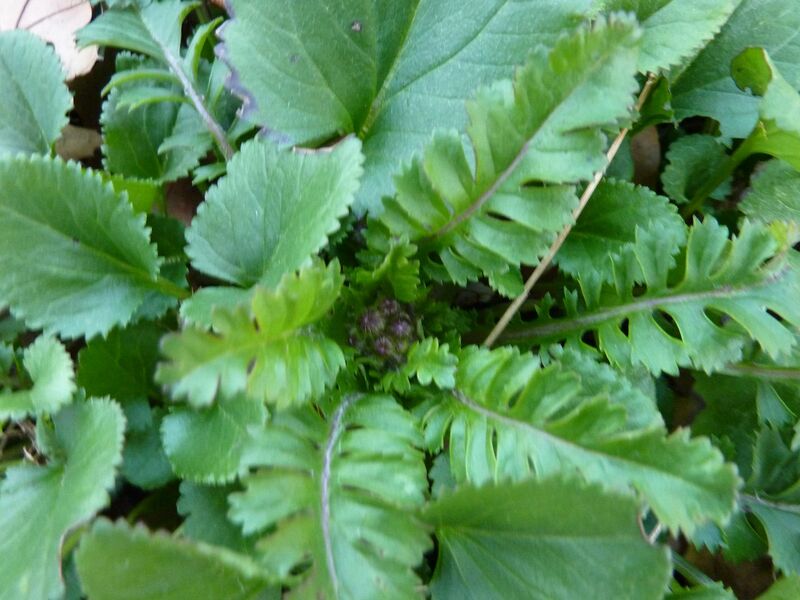 Roundleaf Ragwort, Packera obovata, is also spreading some. It's doing so in nice, garden friendly, tight clumps though. 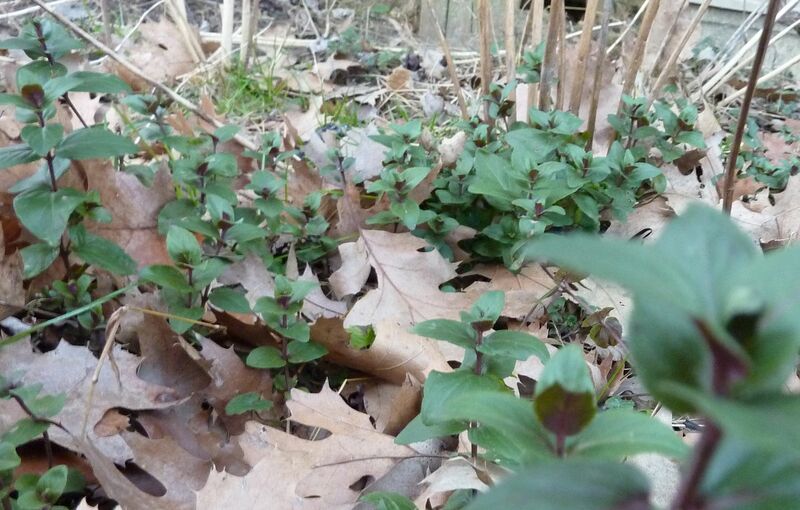 Despite it's seeds being transported by the wind it seems to be growing as a well behaved ground cover. I like this plant so much I'm thinking about spreading it around the yard everywhere. Note the flower buds starting to appear. And then there's Golden Alexander, Zizia aurea. What this is doing with flower buds on it this early is a mystery to me. This is just one plant of the 4 doing it. Perhaps this is a seedling that's got its wires crossed somewhere. The USDA has released a new hardiness zone map for the US. It's nice and interactive. At their site you can click on your state to enlarge. More information was taken into account in forming this map, such as proximity to bodies of water, and I believe even the micro climates found in heavily paved areas. People who live in cities can get temps 10F higher than what they're supposed to due to all the pavement around. Despite the warming trend seen here this does not change your last expected frost date. I know a lot of people think it does though. And they might get away with planting things early but not becuase of this chart. Rather becuase we're in a La Niña year. Even so it's a good idea to protect your investment. Start saving plastic soda bottles or plastic containers and cut off the bottoms for a simple easy plant cover early on. This will protect from frost should a freeze head your way. Once again we're getting close to the Philadelphia International Flower Show, the largest indoor garden show of it's kind. Last year was a complete bore. The theme was "Spring Time in Paris" which basically meant metal lawn furniture sitting among bulbs and rhododendrons for god knows why. Lavender? Herbs? Grape Vines? Poppies? No sir, not in the Paris they're talking about! Last year's show was a complete insult. In years past I'd walk in through the doors and get bombarded by the fragrance of pollen. The air had a strange dampness to it. This feeling just wasn't there that year. There weren't any crazy plants there either. The first year we went the theme was Moss Gardens of Ireland, or something like that, and they had common every day snap dragons with flower stalks 5' tall! These are those same snap dragons you can buy in a flat at any garden center. I have never seen them so big anywhere else before in my life! Another year they had ferns from Australia which were 8' tall! The leaves cam up to form arch ways. 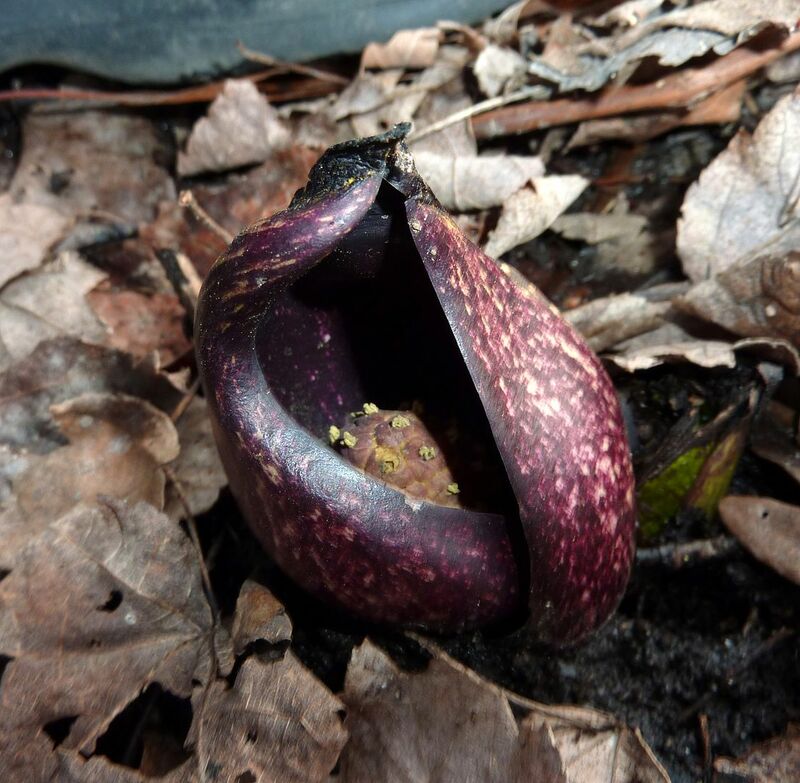 There were carnivorous plants from around the glob being used in landscapes like wildflowers. There were orchids (the common type you see in hardware garden center) of assorted color. Virtually everything was a hybrid or cultivar, or being used in a creative way not just in gardens, but as living walls, and as living pieces of art, with varying functionality... All "Spring Time in Paris," had was a Mary-go-round no one was allowed to ride. And that brings us to this year's theme. Yes beautiful Hawaii, a land with less than 5% of it's native ecosystem in tact thanks to loose importation laws and active volcanoes. If I see something that's NOT invasive at this show I'm going to be very upset. Normally I complain about the lack of native plants and over use of bulbs and rhododendrons at these things but this year seems like a way for them to get out of the norm. This is the year for them to go nuts with water features, bold colors, and expensive tropical landscaping that will freeze to death planted anywhere above the zone 8. He talks about Polyphemus Moth cocoons and Praying Mantis Eggs. He's also on Facebook. Without doing to much exploring of the yard this year I've already managed to find two egg cases of Praying Mantises. One year I found a hatched Polypheumus Cocoon on the ground, so I know they're out there. I know other giant silk moths certainly make cocoons such as the Cecropia silkmoth, Hyalophora cecropia. Other species such as the Imperial Moth, Eacles imperialis, burrow in the ground before forming a chrysalis. I had a friend call me over the summer because she kept finding these "things" emerging from the ground. When they first emerge their wings are as limp as a silk swatch used to clean eye glasses, so they don't look much like a moth at all. Thankfully she sent me some pictures and I told her not to kill them. They turn into something quite pretty. So the cocoons and eggs are out there. Time to start looking. Should you find a giant silk moth cocoon, perhaps a sheltered cage placed just outside the window or inside a shed, or unheated garage would work best. Praying mantis eggs are fairly common along forest edges and among tall grasses in sunny locations. This isn't worth taking any pictures of but today was so nice out I decided to mow my little meadow today. The overgrown grass and plant stems were so thick it had been creating a dense mat hiding the bare ground. I was surprised how many times I had to empty the lawn mower. The two schools of thought here are to remove organic matter or to keep it. Removing the grass and added plant stems is always advisable over the winter. But when mowing we're given the option of letting the organic matter chop up and lay on the ground as a mulch. This doesn't remove the organic matter but does aid in soil building (which is not needed for most prairie plants). This favors plants who's seeds might be tasty for birds and rodents. The organic matter hides them so they can germinate freely. However, this also encourages the existing plant community to come back and shade things out. Removing organic matter entails controlled burns, and bagged mowing. The exposure to bare earth encourages germination to species that normally do so with more sun light. These tend to be plants with seeds the size of grains of sand or there abouts. Burning has the same effect but favors species that like the ashy (sulfur?) added into the soil. This burns off seed coats to some plants while destroying the seeds to others. A sort of third option with removing organic matter would be grazing but I'm not a farm. This is normally done during the growing season. For a fascinating take on the benefits of grazing and the manure, I turn you to the Prairie Ecologist. Apparently the added fertilizer creates a noticeable healthier and greener plants. This encourages the grazing animal (in this case a Bison) to favor that plant when grazing for most of the year. To me, this could explain why deer favor certain plants in one's garden and overlook others, that is all things being equal with "deer resistance." Not mowing at all eventually leads to shrubs and trees taking over. So you see there are ways to encourage and sway a plant community over time. 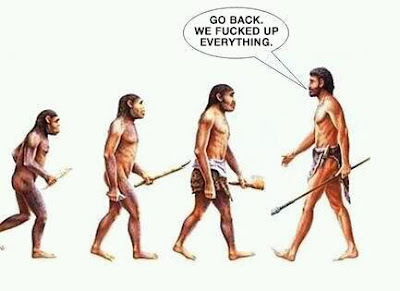 The trouble is everything you do will effect 1 to 3 years down the road.